In 2011/2012 we hosted two workshops on the sharing economy with The People Who Share, a socially minded enterprise dedicated to reshaping global economies through reciprocity, collaboration and exchange. 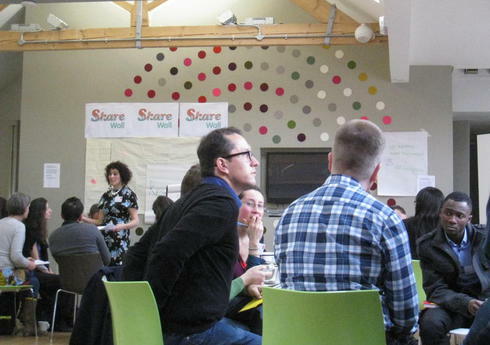 In December 2011 we hosted a kick-off sharing economy workshop, for 44 attendees from social entrepreneurs, academics to business leaders with a common interest in sharing, at Body & Soul in London. Attendees were broken up into groups to discuss 6 topics related to the sharing economy: Values, Governance and Ownership, Consumer Lifestyles, Value Creation and Business Models, Resources, and Labour, Production and Distribution. In June 2012 we hosted a workshop at NESTA for a 50 people who had collaborative consumption business models in London. The aim was to create a space where attendees could connect with each other and explore what a sharing economy could look like. Values that were deemed important for sharing inlcluded; Altruism, Trust, Reciprocity, Community Development and Empathy. Key questions that were explored during the session included; how can we better share power (state, national, global levels)? What should local government do to encourage a sharing economy? How do we better organise or govern ourselves so that sharing becomes intuitive and nature becomes our guiding model? Should sharing be a choice? Key insights included; we must first invest in trust, power takes many shapes and has many faces, but perhaps our most valuable asset is using power, to empower and learn from the successes of getting it wrong…after all, we’re only human.